While using a dehydrator is probably the easiest way to dry peppers, there are a couple of alternatives if you don't own this handy appliance. Both processes take time. There's a very hands-off way to dry homegrown peppers, but it takes quite a long time. Cut the stem of the plant and hang the whole thing in a cool, dark place, like a garage or basement, through the winter months. In a few months, the peppers will be dried. You can dry store-bought peppers in this way, too. Just thread the pepper stems together with a needle and string and hang them as you would hang peppers from a plant. A quicker way to dry peppers is to put them in an oven; this is similar to using a dehydrator. Leave them in for several hours or even days, depending on the type of pepper. 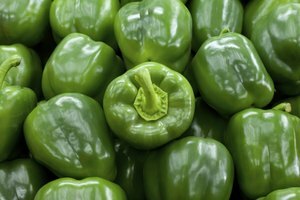 Peppers that have thicker skins, like serranos and especially jalapenos and habaneros, take a few days. Peppers with thinner skins, like tabasco and cayenne peppers, take only a few hours. Check them after an hour and then once an hour when you can to make sure the temperature isn't too high. You'll know if the temperature is too high if the peppers start to get soft or blackened, which means they're cooking instead of drying; you do not want this. If the oven temperature doesn't get low enough to prevent this, the oven method may not work for you, and you're better off going the natural route.